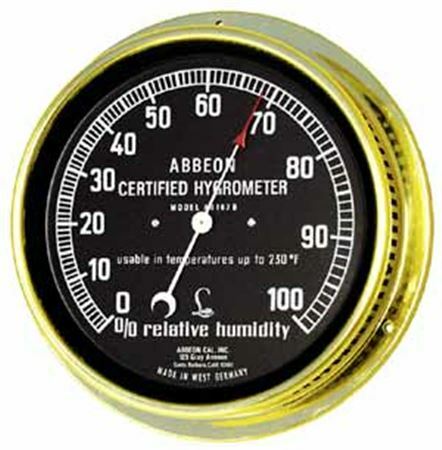 Humidity - Dial w/ Black face & Brass case Model AB-167 Hygrometer is certified to be accurate within ±3%RH + 1 scale division. The dial indicates the complete range of 0 to 100% relative humidity. Each instrument has been tested for accuracy at 3 points on the scale for high, medium and low readings. The calibration and certification are done under ISO-9001 control. Solid brass case Gleaming finish Overall diameter 6" Dial 5" Case drilled for wall mounting Black dial with white numbers and letters Manufactured and tested under ISO-9001 Plastic lens available upon request Accuracy ±3% RH + 1 scale division. Because these are mechanical instruments, they will not hold the ± 3% accuracy on the far ends of the scale (below 30% and above 95%).